"America�s Last Great Wilderness" � the phrase goes back to the early 1950s, to the thoughts of a group of prominent scientists and conservationists whose work led to establishment of the Refuge. 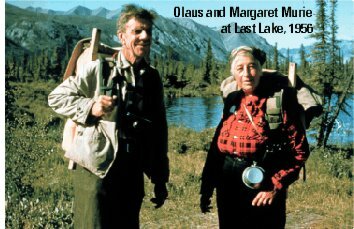 Refuge founders Olaus and Margaret Murie, George Collins, Lowell Sumner and Justice William O. Douglas recognized the value of this remote corner of Alaska for its renowned caribou herds, its moose, sheep, wolves, grizzly and polar bears. But their campaign to preserve this remnant landscape focused on a deeper, all-encompassing quality: wilderness. Here was one of the last large, wild and untrammeled systems remaining on American soil; a place where natural ecological and evolutionary processes continue as they have for millennia. . . .freedom to continue, unhindered and forever if we are willing, the particular story of Planet Earth unfolding here . . . where its native creatures can still have freedom to pursue their future, so distant, mysterious. . . This area offers what is virtually America�s last chance to preserve an adequate sample of the pioneer frontier, the Stateside counterpart of which has vanished. The urge to go places . . . to explore . . . to discover . . . This urge has come down to us from the earliest time and we must not ignore it if we believe in progress of the human spirit.
. . . this last American living wilderness must remain sacrosanct. No refuge was established for more visionary purposes. Here the founders discovered values that are enduring and that transcend physical boundaries. These values touch millions of Americans who might never visit, but who find inspiration and hope believing that the Refuge will always be wild and free.